The Pearl of the Gulf, with a shape of pregnant woman laying in the sea, is the most famous island of the bay. It has fascinated emperors, directors, politicians, actors, philosophers and normal people either by its wild beauty or by the dolce vita you may always smell in the air. It derives its name from the latin "caprae", meaning goats that once here lived numerous. 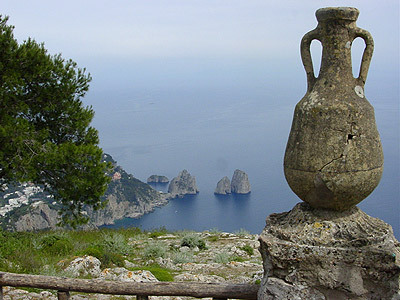 Inhabited since the ancient time by Greeks, Capri became famous under the Roman Empire with Ottaviano who arrived here in 29 b.C. and wanted it for himself. Also emperor Tiberio was in love with this island in fact he moved here for ten years managing the Empire from his beautiful villa. Middle Ages was characterized by frequent Saracens' invasions and by the construction of the walls and the castle to protect the inhabitants. The island then follow the story of Naples passing under the dominion of Angioins, Borbons and finally annexed to the Reign of Italy (1860). Capri is ideal for combining a high profile cultural visit with a glamour one as you can always come across one of the many VIPs who show up here. Greek time left the polygonal walls near the Piazzetta and the Fenician Stair that link Anacapri to Marina Grande. Roman period left some beautiful villas among those we like to cite Villa Jovis and Villa Damecuta. Worthy of a visit the Natural Arch and the Certosa di San Giacomo (XIV cent.). Impossible not to remember the existence of the Grotta Azzurra, “discovered” in XIX century and brought to a huge fame through the sevral descriptions made by artists, poets and writers who have visited it.